ur dedicated support team will look into it and will back to you as soon as possible. Installing your theme is pretty easy! After downloading you should have a foodhunt-pro.zip file. This is a compressed file containing all of the required templates and images required for the theme to function properly. Primary Left MenuDisplay the menu on the Left side on the Header. Primary Right MenuDisplay the menu on the Right side on the Header. Footer MenuDisplay the menu on the Footer. Social menuDisplay the menu containing Social Icons on the Header Top Bar. On mobile device both Primary Left Menu and Primary Right menu is merged in one Single Menu. Use Custom Links to create a menu. Check Social Menu under Theme Location. Slider, by default, is disabled and will only display on Front Page. All the options related to Slider part are available in Appearance-> Customize-> Slider Options. Create the page for each slider and enter title, text and featured image. Page Title will appear as Slider Title, content as Slider Description and features image as Slider Image. Choose the respective pages in drop down options. The recommended size for the slider image is 1900 x 1000 pixels. For better functioning of slider use equal size images for each slide. If featured image is not used in the page then the page is excluded in the Slider. Add Unlimited Number of Slider. Hurray!!! I can choose as many slides as I wanted. Is’nt it cool! If you need more or less number of slides, input the new number in the field: Enter the slider number, click on Save and Publish button and refresh the browser. Choose how slider moves: Fade, Horizontal and Vertical. Change the slider Display time and Slides Duration time. Check the option to display the 5 Latest posts Titles on the Header Top Bar (just above the Menu). There is also option to change the Text before the News Title. Social Icons are also displayed in the header Top Bar. To set up Social Icons see “Social Menu setup” under Menu Setup. Make Header Sticky/non-sticky just by checking the checkbox. By default Header is Sticky. Upload the Logo from Site Identity Section to display it on the Header. Then, here are options to display Header Text only (Site Title and Tagline ), Logo only, display both Logo and Header Text or display none of them. Make Header Search Icon enable/disable just by checking the checkbox. By default Header Search Icon is enable. A Cart icon will only visible on the header, beside the Search icon if WooCommerce plugin is active in your site. Hide it if you don’t want to show it. Upload the image to display it on just below the Menu on the Blog, archive and single page and display the Title on it. Social Link icons on the header are displayed by creating the custom Menu. For further detail please visit Social Menu Setup under Menu Setup section above. Front Page Template is design to display the widgets used in the Front Page Template Sidebar( Appearance-> widgets). You can use a page (which is assigned to Front Page Template) to display widgets on the Font Page. Create 2 pages ie, Home and Blog Page. Assign Home to Restaurant Template. Go to Appearance-> widgets and drag/select the widgets on the Front Page Template Sidebar. Now Home Page will display all the widgets used in Front Page Template Sidebar. To display Home Page as front page: go to Settings-> Reading and select A static page radio option under Front page displays. Now, choose the Home Page in Front page. Also, choose Blog page in Posts page. 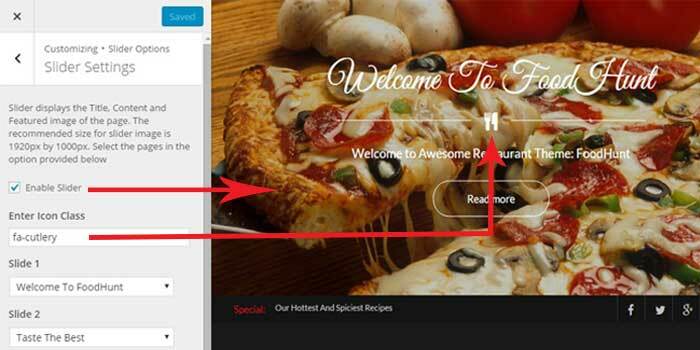 FoodHunt provide Eleven awesome widgets that you can use in Front Page Template Sidebar to make your site look amazingly Beautiful. Go to Appearance-> widgets, drag/select the widgets in the Front Page Template Sidebar to display it on the Front Page Template Page. This widget provide options to enter Title, Description, Select page (drop-down option), Button Text, Button Redirect Link and Button Icon Class. Create a page, enter the Title, Description and set a Featured Image. Info: The Recommended size for featured image is 530px by 440px. Drag the TG: Featured Single Page Widget in the Front Page Sidebar and enter the Title and Description. Select the page in the drop-down option. Enter the Button text and redirect Link and Icon Class. Left the Button Redirect Link empty to link the button to the respective page. This widget enable you to display your services. In this widget, enter the Title, Description and number of pages to display. Create pages for each Services, enter the Title, Description, set a Featured Image and select the Service Template. Info: The Recommended size for featured image is 290 by 290. Drag the TG: Service Widget in the Front Page Sidebar and enter the Title, Description and enter the number of page to display. Select the Image or Color to display as Background. Background image (if used) will override the background color. Show your Portfolio Or Gallery using this widget. Simailar to TG: Service Widget, enter the Title, Description and number of pages to display. Create pages for each Portfolio/Gallery, enter the Title, Description, set a Featured Image and select the Portfolio Template. Info: The Recommended size for featured image is 340 by 340. Drag the TG: Portfolio Widget in the Front Page Sidebar and enter the Title, Description and enter the number of page to display. Show your Team Members. Simailar to TG: Service Widget, enter the Title, Description and number of pages to display. Create pages for each Team member, enter the Title, Description, set a Featured Image and select the Our Team Template. When our Team Template is selected, a Designation meta box will appear just above the Featured page option. You can assign designation to each Team member. In Pro version Three meta boxes for Social icon will also appear when Our Team Template is choosen. Enter the link of social media ie: https://facebook.com/profile_id. Info: The Recommended size for featured image is 380 by 380. Drag the TG: Our Team Widget in the Front Page Sidebar and enter the Title, Description and enter the number of page to display. This widget display your latest/featured posts. In this widget, enter the Title and Description. Select the number of posts to display from either the Latest Posts or Posts from the certain Category. If you choose to Show posts from a category than enter the Category from the Drop-down option. Display Call to action. In this widget, enter the Main Text, Button text, Button redirect link. There is also the option of background color and image. Set color to display it as backgound or Upload image. This widget is for displaying your contact information and contact form. 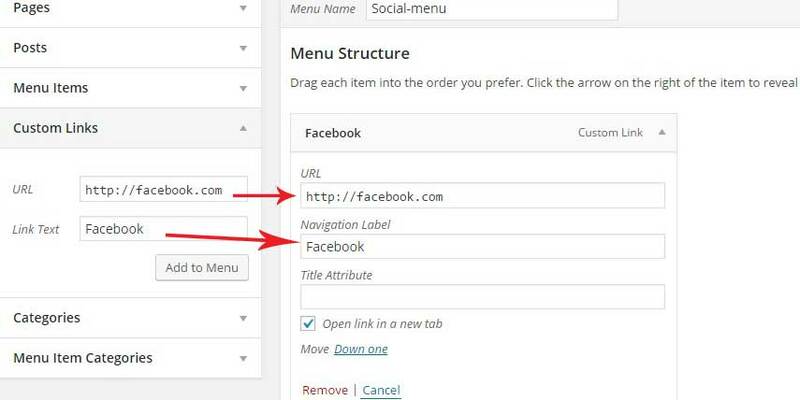 Enter the Title, Description, Choose a Page from Dropdown pages to display page Title and Description. Our theme Support Contact Form 7, it’s free theme available in WordPress repo. Paste the Shortcode of Contact Form 7 in the Shortcode field. Note: If you want to display the Contact Form in Contact page than you should paste the Shortcode in the Contact page too. If you want to display content as shown in our demo page than paste the HTML in page content in a following way. Display the content of the page and a video. Choose a Page from Dropdown pages to display page Title and Description. This widget allow you to display fun title , description, icon and total number of fun count. To activate Fun Facts Widget , drag and drop this widget in Restaurant Template Sidebar Widget Area and fill all neccessary details. This widget is use to display thoughts of your satisfied customer . To achieve this widget follow the steps Simailar to TG: Service Widget, enter the Title, Description and number of pages to display. Create pages for each Testimonial, enter the Title, Description, set a Featured Image and select the Our Testimonial Template. Info: The Recommended size for featured image is 124 by 124. Drag the TG: Testimonial Widget in the Restaurant Sidebar Area and enter the Title, Description and enter the number of page to display. Our Client Widget is basically use to display your bussiness partner logo as in horizontal slide show with two beautiful buttons control. Drag the TG: Our Client Widget in the Restaurant Sidebar Area and enter the Title, Description and enter the client number to limit the clients. This widget is use to display details of Special Recipes . To achieve this widget follow the steps Simailar to TG: Service Widget, enter the Title, Description and number of pages to display. Create pages for each Special Recipes, enter the Title, Description, set a Featured Image and select the Special Recipes Template. Info: The Recommended size for featured image is 400 by 300. Drag the TG: Special Recipes Widget in the Restaurant Sidebar Area and enter the Title, Description and enter the number of page to display. This widget is pritty much similar to TG: Specail Recipes on it’s appeareance, excerpt the Rating and the Price tag. But instead of showing page, it display the Products of WooCommerce. Hence, install WooCommerce and add products with price. Drag the TG: Special Products Widget in the Restaurant Sidebar Area and enter the Title, Description and enter the number of page to display. Choose Latest Products for showing latest product. If you select another option which is: Products from a category then also select a Category from the drop down option. This widget is use to display the information about Upcoming and Ongoing events around the world such as Event Name, Event Schedule, Event Location, Event Details and more. Info: The Recommended size for featured image is 363 by 363. Drag the TG: Events Slider Widget in the Restaurant Sidebar Area and enter the Title, Description and enter the number of events to display. Design based settings and Custom CSS Box are available in Appearance-> Customize-> Design Options. Foodhunt have Custom CSS Box which will ease your work if you need to add CSS in your site. Note: It will strip all the tags. Also, we strongly recommend not to edit the code in the theme’s file. All you changes will be lost if you update the theme. Use child theme instead. Additional options are available in Appearance-> Customize-> Additional Options. Display full content or short description/excerpt on the Posts Page. Hide specific or all the meta/information from the Blog posts and Single post. Go to Appearance-> widgets and drag/select the widgets on the Footer Sidebar 1 to Footer Sidebar 4. Footer Copyright Text is static and options to edit this text will only available in Pro version of this theme. Select number of column for the footer widgetized areas. Choose One Column to Four Column. Display Copyright and Footer Menu either on left/right or on center Position. The recommended size for the slider image is 1920 X 1000 Pixels. TG: Call to Action Widget :- The recommended size for the background image is 1349 X 295 Pixels. TG: Call to Action Video Widget :- The recommended size for the background image is 1349 X 565 Pixels. TG: Featured Posts Widget :- The recommended size for the featured image is 340 X 340 Pixels. TG: Featured Single Page Widget :- The recommended size for featured image is 530 X 440 Pixels. TG: Our Clients Widget :- The recommended size for image is 183 X 137 Pixels. TG: Our Team Widget :- The recommended size for featured image is 380 X 380 Pixels and for background image is 1349 X 1025 Pixels. TG: Portfolio Widget :- The recommended size for featured image is 340 X 340 Pixels. TG: Service Widget :- The recommended size for featured image is 290 X 290 Pixels and for the background image is 1349 X 967 Pixels. TG: Special Recipes Widget :- The recommended size for product featured image is 400 X 300 Pixels. TG: Events Slider Widget :- The recommended size for product featured image is 363 X 363 Pixels. TG: Testimonial Widget :- The recommended size for featured image is 124 X 124 Pixels and for the background image is 1349 X 743 Pixels. Foodhunt provides different hooks to add custom functionalities.